The winners of the 18th Annual Webby Awards were announced, with De La Soul, the Jamaican Bobsled Team and Kickstarter taking the honors. The winners of the 18th Annual Webby Awards were announced, with De La Soul taking Webby Artist of the Year, the Jamaican Bobsled Team taking Athlete of the Year and Kickstarter getting the award for Breakout of the Year. In honor of the 25th anniversary of their debut album, hip hop trio De La Soul released their entire catalog as a limited 25-hour, free, digital download. “It’s about allowing our fans who have been looking and trying to get a hold of our music to have access to it,” De La Soul member Posdnuos told Rolling Stone. The move was heralded as pioneering and resulted in De La Soul trending on Twitter for three days. The Jamaican Bobsled team was awarded Athlete of the Year for their ingenuity in crowdfunding their trip to the Sochi Olympics. “Between a viral campaign on crowdfunding site Crowdit.com and unsolicited generosity of the community surrounding the cryptocurrency Dogecoin, the duo raised $129,687,” according to the Webbys. Kickstarter may have started back in 2009, but according to the Webby Awards, 2013 was the crowdfunding site’s breakout year. From big-name celebrities to unknown entrepreneurs, Kickstarter became a go-to platform for funding a project using the power of the crowd. Perhaps most notable is Oculus Rift, which went from successful Kickstarter campaign to $2 billion Facebook acquisition. For this, Kickstarter is the Webby Awards Break Out of the Year. Medium won a Webby for both Best User Experience and Best Visual Design (Function). Tumblr won a Webby and People’s Voice award for both the Community and Social categories. Vine took the Social Media and the Best Use of Mobile Video Awards. The Epic Split video (featuring Jean Claude Van Damme) won several Webbys, including Best Short Film, Best Branded Content, Best Online Commercial and Best Viral Marketing. 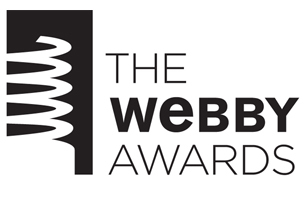 Check out the website for a full list of Webby winners.